The new stove is here! 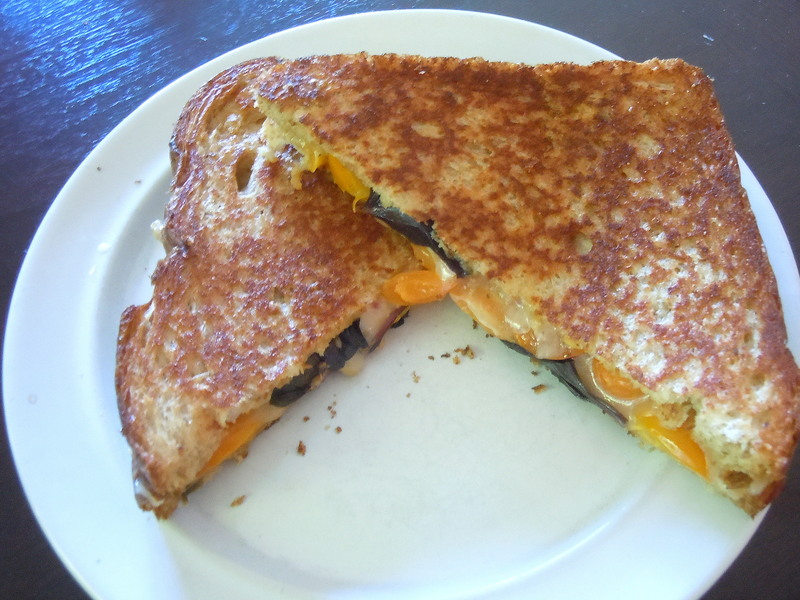 First order of business: grilled cheese sandwiches on that center griddle. We each made our own; mine was sharp cheddar and sliced cherry tomatoes with opal basil leaves. The heavy cast iron griddle (15 lbs.!) made for one crunchy crust, let me tell you. The griddle has inspired me to use my cast iron skillet more often. As you know, the more you use cast iron, the better it gets. My skillet — a flea market find — is in the no-man’s-land between its original state (a rusted mess) and the perfectly seasoned hunk of nirvana it’s destined to be one day. But we carry on nonetheless, and my skillet is slowly gaining a glossy patina. Dinnertime tonight. Here’s what I had for protein: two tiny filets of beef — we’re talking maybe three ounces each — to feed my husband, my teen athlete son, and maybe me as well. I also had a bag of lovely red potatoes from Turner’s farm market and gorgeous deep yellow summer squash from King Berry farm market. Skillet supper, here we come. I simmered the taters for a few minutes in salted water to jumpstart the process. While they were simmering, I cut the steaks into chunks and browned them in the hot cast iron skillet, just long enough to get some color on the beef. The pan now had some nice browned bits, and the steak was still quite rare in the center. The plan was to pop the steak back in the pan at the end to finish up. Those golden squash went into the hot skillet with some onion and garlic, to soften and soak up those lovely meaty bits. Once the potatoes were nearly tender, they went into the skillet as well. Cajun seasoning added extra flavor. When the veggies were beautifully caramelized, the steak went back in for a few minutes to finish cooking. Put the potatoes in a small saucepan, cover with water, and add a generous amount of salt. Bring to a boil over high heat, reduce heat to medium, and simmer for about 8 minutes until potatoes are beginning to be tender but aren’t done cooking. 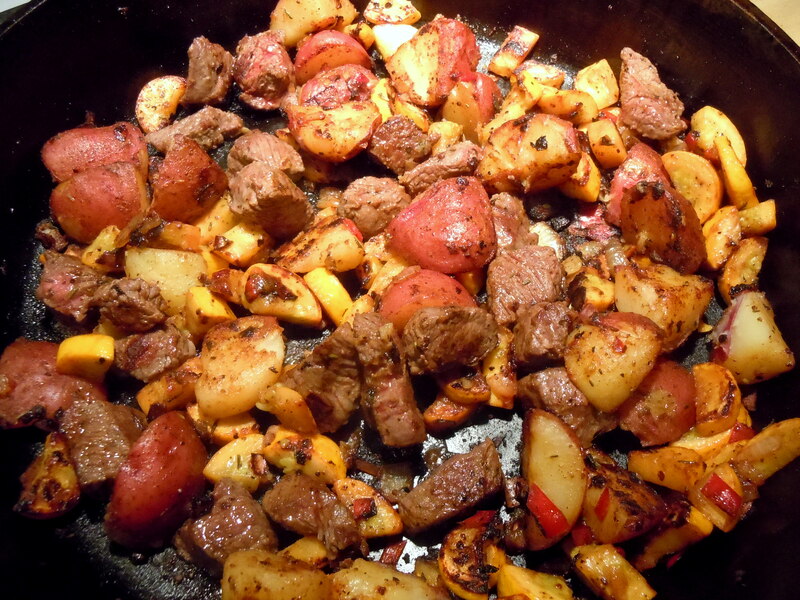 While the potatoes cook, heat a skillet (preferably cast iron) over high heat. While it warms, season the beef with salt and pepper. Add 1 tbs. of the oil and the beef to the hot pan; turn the heat down to medium-high. Cook for 1 minute without touching. Flip the beef and brown a second side for 1 minute longer. Remove beef to a plate. Add the remaining tbs. oil, then the onion, garlic, squash, and Cajun seasoning. Cook, stirring occasionally, until the veg are softened and beginning to brown. The potatoes should be ready by now. Drain them well. Add the butter to the pan and add the potatoes. Cook for another 10 minutes or so, stirring now and then, until everything is nicely caramelized. Add the beef back in and cook for 1-2 minutes longer, until the beef is heated through and cooked to your liking. Serve hot with a sprinkling of fresh parsley or chives, or grated parmesan, or a dollop of sour cream, or sour cream plus horseradish …. This entry was posted in main courses, meat, poultry,and fish and tagged beef, one-pot meals, onions, potatoes, steak, summer squash. Bookmark the permalink.